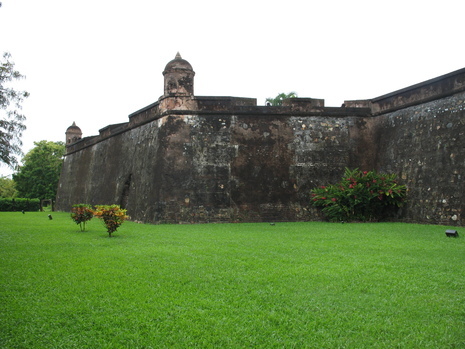 On October 16, 1779, following a brief attempt at siege, a force of 150 British soldiers and seamen assaulted and captured the fortifications at San Fernando de Omoa in the Captaincy General of Guatemala (now Honduras) on the Yucatan Peninsula. The British forces managed to overwhelm and capture the Spanish garrison, consisting of 365 men. The fort was only held by the British until November 1779, when the garrison, reduced by tropical diseases and threatened by a Spanish counterattack, was withdrawn. The British emplaced some gun batteries, with which they opened fire on the fort, with supporting fire from three ships. Simón Desnaux, the fort's commander, returned fire, damaging one of the ships, but he was badly outnumbered. He refused an offer for surrender, hoping that Gálvez would be able to send additional support. On the night of October 20, a few British men snuck into the fort and opened one of the gates. After a brief gunfight, Desnaux surrendered. Among the spoils the British won when they gained control of Omoa were two Spanish ships anchored in the harbor. They carried more than three million Spanish dollars of silver.